Bring your family and friends and let Blue Harbor Tropical Arboretum bring the fun. Special events and family days are frequently celebrated in this gorgeous setting as groups enjoy the outdoor space and full amenities available. Whether you need entertainment for the kids or a serene setting for your vows, our beautifully manicured grounds and incredible space allow for you to customize your own event. 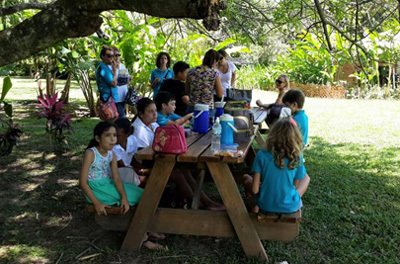 A frequent location for local school field trips, Blue Harbor Tropical Arboretum offers kids the opportunity to learn about their environment in a safe and interesting way. Guided tours educate groups on the types of fruit trees that grow on Roatan, on the opportunities for agricultural co-ops on the island, and on the sustainable practices Blue Harbor adheres to and encourages all other local businesses to adhere to as well. Family outings to Blue Harbor Tropical Arboretum offer a beautiful, serene setting to allow kids to get fresh air and learn about a variety of fruits, trees, and local wildlife. The Porch restaurant offers a variety of lunch and snack options, enabling you to entertain the family for hours. 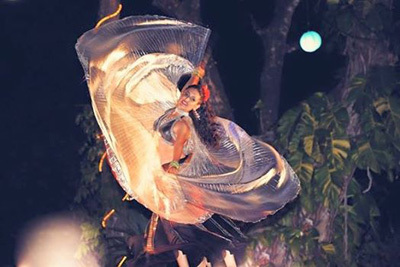 Special events at Blue Harbor Tropical Arboretum offer space for live music, shaded and open areas, and plenty of opportunities to enjoy the beautiful grounds. With the space and capacity to comfortably accommodate groups of any size, we are able to work with you based on your needs. Contact us today to plan your group’s personalized special event.